Ten opportunities remain to attend one of the 2019 “Strategic Farming – Maximizing Return on Investment” workshops. At these sessions, key cost factors in crop budgets will be discussed, as well as the likelihood for a return on investment on practices ranging from a foliar fungicide application to a "build and maintain" soil fertility program. Soybean aphid management strategies, seed and trait technologies, tips to evaluate marketing claims, and best management practices to ensure the marketability of grain will also be discussed. Registration is open at z.umn.edu/strategic-farming for these workshops sponsored by University of Minnesota Extension and the Minnesota Soybean Research and Promotion Council.Registration at least 7 days prior to each event is strongly encouraged in order to guarantee a seat, handouts, and a meal. All programs will run from 9:00 am to 12:30 pm (except for the Owatonna program which will run from 9:00 am to 2:00 pm), and include lunch. Private Pesticide Applicator Recertification will run concurrently at the Fairmont, and McIntosh locations where attendance until 2:30 pm is required to receive recertification. Bonus crop production topics will be presented at the Owatonna location from 12:30-2:00 pm. The Small Grains Program will follow from 12:30 – 4:00 pm at the Slayton location. For more Details and to register: z.umn.edu/strategic-farming. 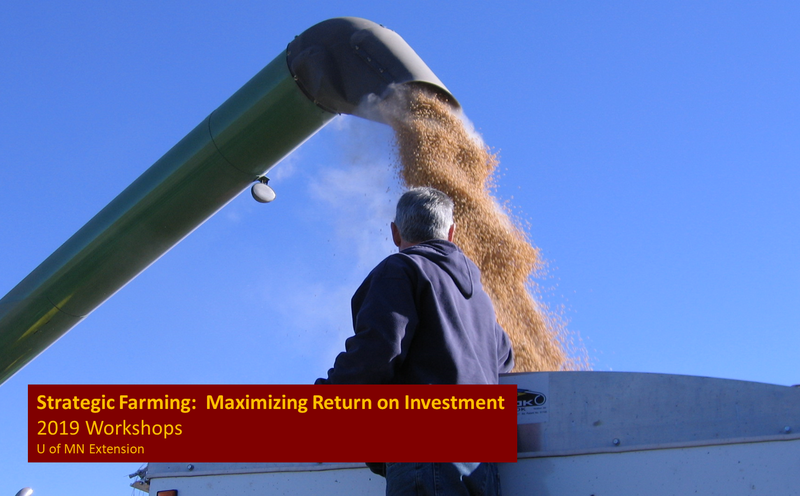 If you farm or work with farmers and want to learn more about crop management strategies to maximize return on investment, these workshops are for you! For more information, please contact Liz Stahl at 507-372-3900 or stah0012@umn.edu, or Seth Naeve at 612-625-4298 or naeve002@umn.edu.